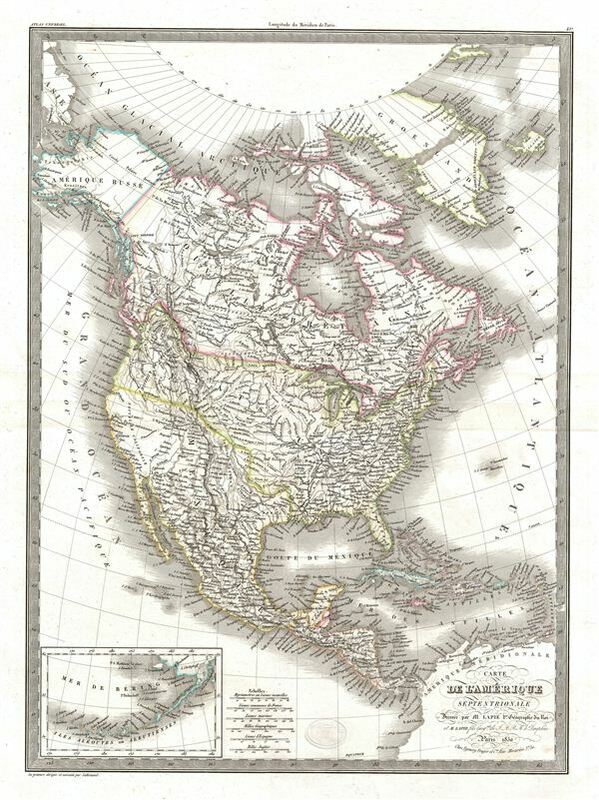 A fine first edition example of M. Lapie's 1830 map of North America. The map covers the entire North American continent from the North Pole and Arctic Ocean to Panama and from the Pacific Ocean to the Atlantic Ocean. The map shows Greenland, Russian America, New Britain, Canada, Unites States, Mexico, Guatemala, Bahamas, Cuba and Haiti. An insert in the lower left corner details the Bering Sea and the Aleutian Islands. During this time in history, United States was rapidly expanding. Canada saw an increase in British settlements and was facing a division between its French and British communities. This ultimately led to a rebellion in 1837 an 1838. There were tensions in Mexico due to the rebellion of the english speaking region of Texas and the tension between the liberals and the conservatives. This map was engraved by Armand Joseph Lallemand as plate no. 42 in the first edition of M. Lapie's important Atlas Universel. This map, like all maps from the Atlas Universel features an embossed stamp from the Lapie firm. Rumsey 2174.042. Phillips (Atlases) 754, 765.